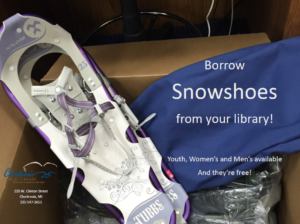 Snowshoes: The library has adult and youth snowshoes available for lending to Charlevoix Library card holders. Please complete this Snowshoe Waiver 2019 and bring it with you when you pick up the snowshoes. One week check out. Renewals on these items are not available. 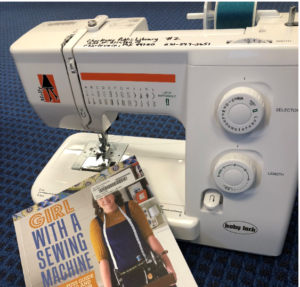 Sewing machines are available for Charlevoix Library card holders. The case includes the machine, an instruction booklet and some basic supplies. One week check out. Renewals on these items are not available. 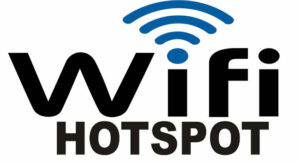 Wi-Fi Hotspots are available to Charlevoix Library card holders. These items provide wi-fi access in remote locations. One week check out. Renewals on these items are not available. High demand. Please be respectful of others needs and limit checkouts to once per month per household.